The Optrel e680 Auto darkening welding helmet was designed for welding professionals and is an excellent choice for almost any welding application. Welding is a dangerous occupation. A welder uses high-powered welding torches to melt the edges into weld seams and weld joints. As such, a welder is exposed to many hazards such as electric shock, breathing injuries from inhaling toxic fumes, retinal eye injury and skin burns. Here we’ll look at the Optrel e680 Welding Helmet and how it protects you. We can’t stress enough that a welder must wear rated clothing and equipment for their own protection during all welding operations. Such gear can include helmets, shields, safety glasses, gloves, aprons and the right type of shoes. According to the Center for Disease Control and Prevention, approximately 2,000 U.S. workers receive medical treatment every day after suffering an eye-related injury on the job. During welding and cutting operations, one of the best pieces of safety gear a welder can own is a welding helmet. Welding operators must use a welding helmet to protect their eyes from heat, glare, and flying hot metal fragments. Many operators prefer a welding helmet that has an auto-darkening feature. The bright light given off by the welding arc while welding can be blinding and cause retinal damage if proper precautions are not taken. An auto-darkening helmet helps protect welding operators from the effects of such light. It allows an operator to weld a joint or seam without the welding arc damaging their eyes. It’s an essential piece of gear for those welders involved in arc welding where the electric light produced can give off heavy doses of radiation. Different welding styles produce different levels of light and heat, but you will need adequate protection for all levels. Even if you are just a hobbyist or home welder, you need a good welding helmet with an auto-darkening feature, and the Optrel e680 fits the bill. There are a variety of factors to consider when selecting an auto-darkening welding helmet. The three most important criteria are fit, impact resistance and UV protection. The Optrel e680 has many features many that are unique and proprietary to Optrel. The strongest feature is the lens, which is amazingly responsive to light from any kind of welding with 2 darkening shade levels: from 5 to 9 and from 9 to 13. Many auto darkening helmets come in a green or dark gray color; however, the lens on the Optrel e680 is a clear HD lens with very little change in color so the operator can weld precisely. You don’t have spend a lot of time adjusting the sensitivity and delay settings as the Optrel e680 has an exclusive autopilot feature. This features an adjustable, sophisticated sensor slide that automatically recognize the amp settings and adjusts the shade of the lens to match. The helmet offers a grinding mode to prevent automatic darkening when grinding. 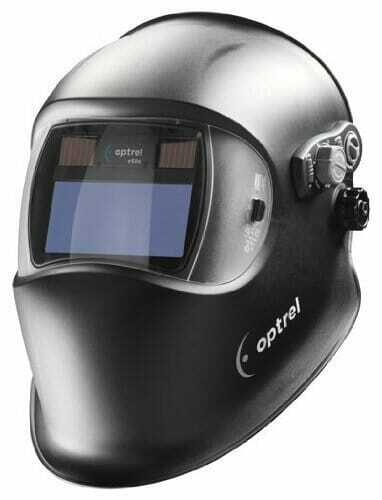 The Optrel welding helmet also features a one-of-a-kind twilight technology to reduce eye fatigue, so your eyes can better adjust to the shift in the light. The external controls are very user friendly. It has a long life battery, so you won’t have to change it out very often. This welding helmet’s design helps make it easy to wear during overhead welding. The spherical lens also helps keep weld spatters from immediately damaging the shell and ATF filter. The viewing area is smaller than some more elite welding helmets, although it’s adequate for most welding operations. Some users say the auto-darkening has a slower reaction time than many other helmets. This could be a fatigue issue if you do lots of stop and start welding operations. Optrel is a Swiss company that carries the ISO 9001 quality certification. They offer a 3 year guarantee - of course, that doesn’t include the batteries. The whole body must be protected when welding due to the potentially dangerous nature of the craft. The eyes have special safety needs due to the seriousness of the injuries that can result from impact, UV rays and improper fit. Its HD lens and a host of other unique features provide the operator with superior eye safety and the ability to weld accurately.